I don’t know if Romero knew anything about the subject of this column, but I’m sure he would have been intrigued. During a nocturnal field trip in southern Ohio’s Scioto County in August, my group noticed an odd thing. Plastered to a tree branch was a strange, fluffy cocoonlike object. Perched atop was a saddled prominent caterpillar, a type of moth larva. Upon closer inspection, I realized what we were seeing: a zombie caterpillar, rewired and forced to act as guardian of its killers. If you were a being that reincarnates, choosing a caterpillar for your rebirth would be a bad idea. You could take myriad forms, as there are more than 2,000 species of moths and a bit more than 100 species of butterflies in Ohio, all of which are caterpillars for part of their life cycle. But the problem is they have a mortality rate near 99 percent. These tubular bags of goo are preyed on by all manner of beasts. Songbirds snap them up, mice relish them, and scores of predatory insects feast on them. To survive this predatory gauntlet, many moths and butterflies practice carpet-bombing reproduction. A female might lay hundreds or thousands of eggs to ensure that a few of the offspring survive to the adult reproductive stage. The rest will fuel the food chain. Perhaps no caterpillar predator is stranger or more horrifying than the tiny wasps in the genus Glyptapanteles. These wasps are parasitoids, and it’s worth noting their difference from parasites. Lice, ticks and chiggers are all parasites. They’re annoying and might even carry diseases, but they do not, typically, directly kill their hosts. Not so the parasitoid. The ultimate fate for their hosts is usually death, and sometimes in grislier ways than those concocted by Romero’s fertile imagination. A female Glyptapanteles wasp seeks out appropriate caterpillar hosts, and when she finds one, the attack commences. She alights on the victim and uses a needlelike ovipositor at the end of her abdomen to inject several dozen eggs. The eggs quickly hatch, and the wasp grubs feast on the caterpillar’s nonvital tissues and fluids. Eventually, the mature larvae exit en masse by boring holes through the caterpillar’s skin. The shed skins of the grubs’ final molt apparently plug their exit holes. 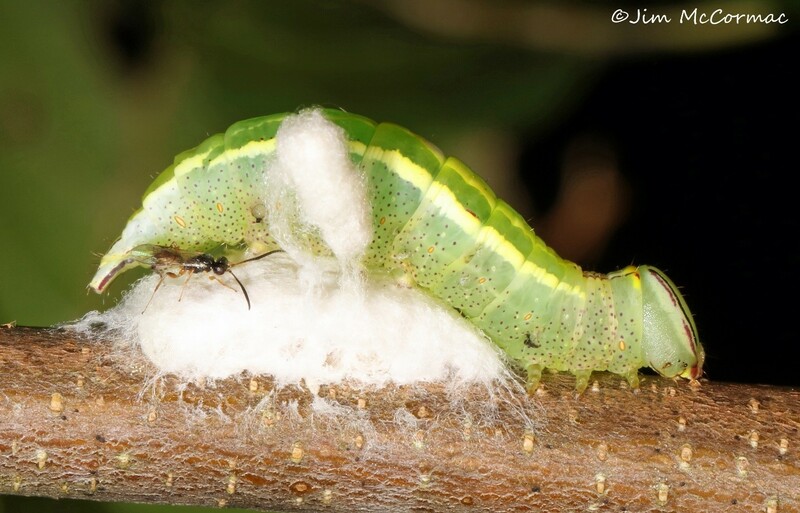 Upon emergence, the grubs begin spinning silken cocoons under the caterpillar, which, incredibly, begins helping them by enshrouding all of the wasp larvae in a thick, protective bag of its own silk. Once all of the wasp grubs are safely ensconced in the silken shelter, the caterpillar stands guard atop the structure, thrashing its body at any potential predator that dares to encroach. The mechanisms that trigger the “zombification” of the caterpillar are imperfectly known, but it’s probably due to some chemical brew injected by the wasp. By the time the grubs transform and emerge as wasps, the caterpillar will be dead or nearly so, having given its life to help ensure the survival of its nemesis. In spite of all the apparent protections, some predators slip through and attack the grubs. Note the tiny wasp in the photo. It might be a “hyperparasitoid,” a predator of the predator. The wasp appears to be injecting eggs into the grubs within the cocoon.